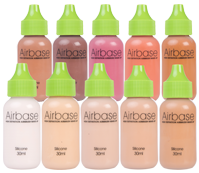 This airbrush kit is for professional, salon, mobile or home use with your preferred brand of airbrush-ready or suitably-thinned makeup. 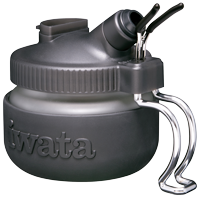 The Iwata Revoluton CR airbrush has a large gravity cup and a 0.5mm nozzle. The Iwata Revoultion is a well-designed, quality brand airbrush suitable for large areas down to detail spraying. The Iwata Smart Jet Pro compressor switches on and off automatically when you press the airbrush trigger, providing instant air at the pressure you have set it, and turns the compressor off again when the airbrush is not in use. The Smart Jet Pro has a metal protective case with integral regulator and pressure gauge. The compressor is also suitable for running an airbrush for tanning, nail art or body art. This kit also contains two airbrush cleaners. The Revolution CR airbrush is also suitable for body art. Cleaning an airbrush is important anyway, but even more so when switching between products with different bases, such as water-based, alcohol-based or silicon-based. 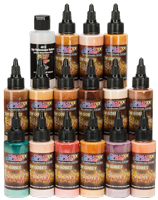 Ideally we recommend an airbrush dedicated to each type of product. Please click here to view all other make-up kits.